Beijing: Chinese President Xi Jinping has stressed efforts to carry forward the Chinese nation’s tradition of loving, planting and protecting trees, and to involve the whole society in promoting afforestation. 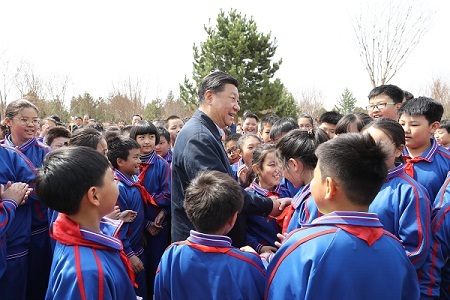 He made the remarks while attending a tree-planting activity in east Beijing’s Tongzhou District and planting saplings of different types of trees. Xi said this year marks the 40th anniversary of National Tree Planting Day. In the past 40 years, China’s forest area and forest stock volume have doubled, respectively, and China is home to the world’s largest man-made forest. The proportion of China’s contribution to the world’s vegetation increase also ranked first. Xi called for solid efforts to improve people’s living environment, develop a green economy, and strengthen forest management and protection to achieve more tangible results.